This well built, 20 year old property, is situated in a quiet countryside area. It is only a couple of miles away from a market town with most amenities. The property is served by good roads to the North, South and the coast of Portugal. There is enough room at the front patio area to park a car. The property is fully enclosed in a masonry wall. On entering the property there is a porch with roof tiles and the wooden front door. Through here you are received by a spacious, open plan lounge with a dining area to the right, a bar area underneath the staircase (this could easily be converted to a cloakroom), which leads upstairs and a decorative, stone arched hallway access to the kitchen on the left, the bathroom on the right and the downstairs bedroom in front. Up the staircase, on the landing, to the front, there’s a spacious, tiled bathroom with a bathtub. To the left there’s a large, double aspect bedroom with built in wardrobes that could easily be 2 double bedrooms. To the right there’s a large double bedroom with built in wardrobes and access to the loft area, which is all built with concrete beams. The low maintenance garden at the back, with a barbecue area, has a room that could be converted to a workshop. 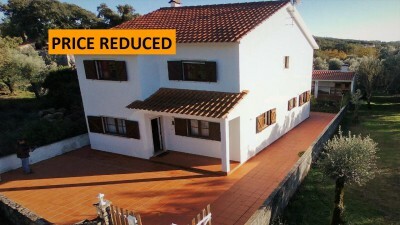 The property is located in an hamlet called Troviscal which is only 3.9km from the village of Cabaços, which has most amenities required including cafés, restaurants, builders yard and gym. This municipality town of Alvaiázere is at 7.4km driving distance, where you can find a registry office, notary services, banks, supermarket, schools, public swimming pool parks, cafés en restaurants, etc.